Yes, this post is about a regular store that really has no real place as a tourist destination, but in Guam, Kmart is actually a tourist destination. With tour buses heading there every 10 or 20 minutes, it is considered part of the must go places for shopping. I do admit that it is pretty good overall and you can get a few good deals. The only problem is that it is a standard Kmart/Walmart shop. The prices are cheaper for daily items like toothpaste and food, but for tourist items the prices are not very different. For me, I end up just buying a few things but I did see a few tourists go crazy buying several bags of things. The best part for me was that I was able to buy a few necessities that I can’t get in Japan and I was even able get Sox a little toy as a gift. I have been buying him omiyage for the last few trips now and while the treats available were not very good, I did find a simple toy for him. For any westerner who needs to stock up on supplies for Japan, Kmart is the place to do it. I wouldn’t really recommend visiting Kmart but if you are in Guam for an extended time, or you really need supplies, then you should stop by. The main reason I am talking about Kmart is mainly because of my unexpected experience there. I was in the middle of shopping and weaving my way in and out between the locals and the tourists alike when suddenly everything went BLACK. No, I wasn’t punched in the face by an irate person. Everything was quiet and a lot of confused people could be heard. The locals were bemused and the tourists were a little shocked and confused. Basically, Kmart was probably using too much power for the building and the circuit breaker flipped shutting power to the entire store. While the blackout only took about 30 seconds, I did see several people quickly pulling out their phones to use as flashlights, including myself. I don’t know if this was a regular occurrence at Kmart or on Guam but it wasn’t reassuring. After looking at Google Maps, and noticing the store had roof top parking lot, I wasn’t really excited by the idea of cars parked on top of a building that can’t keep the power going smoothly. I wonder if they will have a similar problem that has caused other roofs to collapse due to old age and bad construction. Personally, I would still go back again if I am in Guam as I always need supplies; nothing wrong with visiting a nice cheap place. 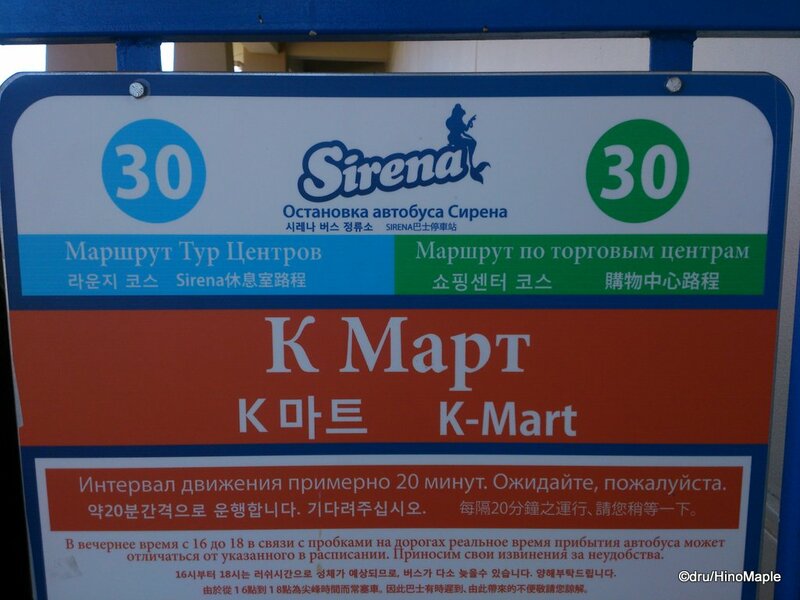 Note: Kmart is pronounced “kay-mart”. They are sometimes referred to as K-mart as well. 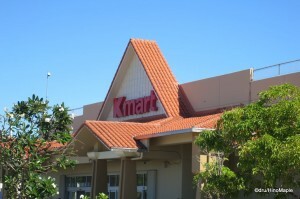 This entry was posted in USA and tagged Guam, K-Mart, Kmart by Dru. Bookmark the permalink. Also, at meat section, I saw what looked like a big sausage with dog’s picture. They were the product for dogs. I had never seen anything like that in Japan. Very interesting. I know what you mean by supermarkets in other countries. I even like visiting supermarkets in different areas of Japan. 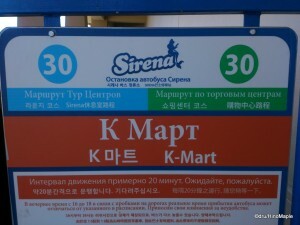 I was just surprised that Kmart was actually on the actual tourist route. Usually you have to go on your own to find supermarkets and such.